GENESIS 1:26 KJV "And God said, Let us make man in our image, after our likeness: and let them have dominion over the fish..."
23And the evening and the morning were the fifth day. 24And God said, Let the earth bring forth the living creature after his kind, cattle, and creeping thing, and beast of the earth after his kind: and it was so. 25And God made the beast of the earth after his kind, and cattle after their kind, and every thing that creepeth upon the earth after his kind: and God saw that it was good. 26And God said, Let us make man in our image, after our likeness: and let them have dominion over the fish of the sea, and over the fowl of the air, and over the cattle, and over all the earth, and over every creeping thing that creepeth upon the earth. 27So God created man in his own image, in the image of God created he him; male and female created he them. 28And God blessed them, and God said unto them, Be fruitful, and multiply, and replenish the earth, and subdue it: and have dominion over the fish of the sea, and over the fowl of the air, and over every living thing that moveth upon the earth. 29And God said, Behold, I have given you every herb bearing seed, which is upon the face of all the earth, and every tree, in the which is the fruit of a tree yielding seed; to you it shall be for meat. � And God said, Let vs make man in our Image, after our likenesse: and let them haue dominion ouer the fish of the sea, and ouer the foule of the aire, and ouer the cattell, and ouer all the earth, and ouer euery creeping thing that creepeth vpon the earth. And God said, Let us make man in our image, after our likeness: and let them have dominion over the fish of the sea, and over the birds of the heavens, and over the cattle, and over all the earth, and over every creeping thing that creepeth upon the earth. 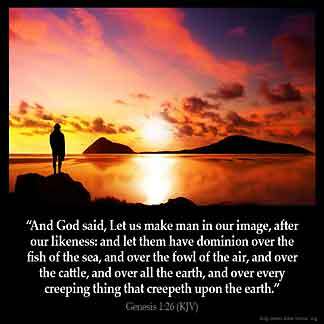 And God said, Let us make man in our image, after our likeness: and let them have dominion over the fish of the sea, and over the fowl of the air, and over the cattle, and over all the earth, and over every creeping animal that creepeth upon the earth. 1:26-28 We have here the second part of the sixth day's work, the creation of man, which we are in a special manner concerned to take notice of. Observe, That man was made last of all the creatures, which was both an honour and a favour to him: an honour, for the creation was to advance from that which was less perfect, to that which was more so and a favour, for it was not fit he should be lodged in the palace designed for him, till it was completely fitted and furnished for his reception. Man, as soon as he was made, had the whole visible creation before him, both to contemplate, and to take the comfort of. That man's creation was a mere signal act of divine wisdom and power, than that of the other creatures. The narrative of it is introduced with solemnity, and a manifest distinction from the rest. Hitherto it had been said, Let there be light, and Let there be a firmament: but now the word of command is turned into a word of consultation, Let us make man - For whose sake the rest of the creatures were made. Man was to be a creature different from all that had been hitherto made. Flesh and spirit, heaven and earth must be put together in him, and he must be allied to both worlds. And therefore God himself not only undertakes to make, but is pleased so to express himself, as if he called a council to consider of the making of him; Let us make man - The three persons of the Trinity, Father, Son, and Holy Ghost, consult about it, and concur in it; because man, when he was made, was to be dedicated and devoted to Father, Son, and Holy Ghost. That man was made in God's image, and after his likeness; two words to express the same thing. God's image upon man, consists, In his nature, not that of his body, for God has not a body, but that of his soul. The soul is a spirit, an intelligent, immortal spirit, an active spirit, herein resembling God, the Father of spirits, and the soul of the world. In his place and authority. Let us make man in our image, and let him have dominion. As he has the government of the inferior creatures, he is as it were God's representative on earth. Yet his government of himself by the freedom of his will, has in it more of God's image, than his government of the creatures. And chiefly in his purity and rectitude. God's image upon man consists in knowledge, righteousness, and true holiness, #Eph 4:24|; Col 3:10. He was upright, #Ec 7:29|. He had an habitual conformity of all his natural powers to the whole will of God. His understanding saw divine things clearly, and there were no errors in his knowledge: his will complied readily and universally with the will of God; without reluctancy: his affections were all regular, and he had no inordinate appetites or passions: his thoughts were easily fixed to the best subjects, and there was no vanity or ungovernableness in them. And all the inferior powers were subject to the dictates of the superior. Thus holy, thus happy, were our first parents, in having the image of God upon them. But how art thou fallen, O son of the morning? How is this image of God upon man defaced! How small are the remains of it, and how great the ruins of it! The Lord renew it upon our souls by his sanctifying grace! That man was made male and female, and blessed with fruitfulness. He created him male and female, Adam and Eve: Adam first out of earth, and Eve out of his side. God made but one male and one female, that all the nations of men might know themselves to be made of one blood, descendants, from one common stock, and might thereby be induced to love one another. God having made them capable of transmitting the nature they had received, said to them, Be fruitful, and multiply, and replenish the earth - Here he gave them, A large inheritance; replenish the earth, in which God has set man to be the servant of his providence, in the government of the inferior creatures, and as it were the intelligence of this orb; to be likewise the collector of his praises in this lower world, and lastly, to be a probationer for a better state. A numerous lasting family to enjoy this inheritance; pronouncing a blessing upon them, in the virtue of which, their posterity should extend to the utmost corners of the earth, and continue to the utmost period of time. That God gave to man a dominion over the inferior creatures, over fish of the sea, and over the fowl of the air - Though man provides for neither, he has power over both, much more over every living thing that moveth upon the earth - God designed hereby to put an honour upon man, that he might find himself the more strongly obliged to bring honour to his Maker. I believe God is talking about He and Jesus : I am made after the image of God : I am not really smart enough to figure that out , So I will take God's word at face value : So therefore God has given to me to have dominion : Authority over all that He created : It does not have authority over me : For example : I go fishing and I command those fish to come to me . As also over all alse : I still have a way to go to be able to get this established in my heart !!!! I have dominion over all : God did not say over man : God doesn't have authority over man : He gave me the ability to make decisions : I choose to make those decisions with Holy Spirit help : That way , I know I made the right choice : I have God's word to be able to discern between that which is Good and evil !!! Reading John 1:1-5, we will find out that The Word was with God in the beginning. Verse 1 says 'lInux the beginning was the Word, the Word was with God and God was the word ' '. So if you agree with the Bible, you will know that The word became flesh Jesus . And the Same John 1 says that by the Word was everything made and without Him there was nothing made that was made. That means God was using the Word Jesus to create everything and that means the consent of the Word Jesus , which is also God according to John 1:1 was needed in the creation process. If so, who was God now speaking to that ' 'Let us make man in our own image and likeness? ' ' If not Jesus. Now that said, if you believe in the Word in John 4:24 ' 'God is a spirit: and they that worship Him must Worship Him in truth and in Spirit ' ', then there is no reason for you now not to know that God is Jesus and God is the Spirit. The reason why He is called the HolySpirit is because there can be evil spirit but His own Spirit is Holy. I pray that God explains it to you Himself the Same way He did to me so that no indoctrination will be a veil on your face. Amen!!! John 1:1-2 "in the beginning was the word, and the word was with God, and the word was God " This word "Logos " that was with God at the beginning was the Theophany before manifested in a Physical body. So God is talking to his Theophany. For example: there 's a body that 's waiting for us as soon as we leave this one, so in there we enter into that body and that 's the kind of body that God was when He said "Let us make man in our own image and in our likeness ". Lastly: According to John 1:1-2,,,that Theophany came down and was made flesh and dwelt among us, to redeem the man.He 's not talking to the Angels nor Trinity, He 's talking to his Theophany.